For dental patients missing several adjoining teeth, one very common treatment option is a dental bridge. A dental bridge is a permanent restorative dentistry treatment that involves the attachment of one or more prosthetic teeth to the adjacent natural teeth. These “fake teeth” not only fill in the space that the missing teeth have created, but they also keep the surrounding natural teeth from shifting out of place over time. This dental treatment also has a variation that offers a more fixed solution by securing the dental bridge with several dental implants (rather than the prosthetic teeth), which are secured to the underlying jawbone for stability, stimulation, and ultimately, bone regrowth. 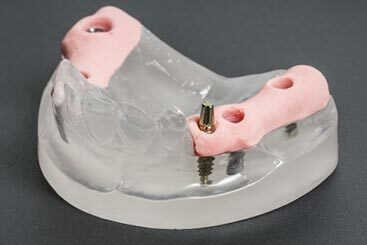 The main advantage of fixed dental bridges over its removable counterpart is its superior functionality (i.e. increased support and stability) in terms of acting and feeling like natural teeth. If you are missing two or more adjacent teeth and would like to explore the possibility of dental bridges with prosthetic teeth or dental implants, feel free to reach out to us to learn more. Or, if you’re ready to schedule an appointment at Constitution Dental in Downtown Ottawa, we’d love to see you!